Find hotel near Royal Armouries - White T ..
United Kingdom’s National Museum Of Armours, the Royal Armories exhibiting Arms and Armours in the White Tower of the Tower Of London is one of the oldest museums in the world. The museum is a symbol of the power of the iconic Normans since the reign of William the Conqueror. The museum boasts of the invaluable collections of the National Artillery Collection, National Firearms Collection and so on. The Gothic Plate Armour, the 12.5inch muzzle loading Rifled Gun and a number of artefacts are exhibited here. The Lines Of Kings (Wooden Head of Edward III, Henry VIII’s armour, Wooden Horse), Treasures (The Tiffany Revolver, Saddle of Henry, Ethiopian Shield), Powerhouse (Coats, Coat of Arms, Steam Gun), Storehouse (Lion Sculpture, Burmese Bell) are the things on exhibit. There are a number of food joints too around the museum. London is brimful with interesting attractions like The London Eye, British Museum, Tower Of London, National Gallery and Madame Tussauds Museum. You can also check out the whole list of things to do in London. Insider tips and expert guides will make sure you enjoy the city to its fullest. You can do so by booking any of the London tours. Create a customized plan for your visit using the London trip planner. You can use ready templates or start from scratch for the same. Fine Accommodation options like George Hotel, Mabledon Court Hotel and The Bloomsbury Park Hotel - A Thistle Associate will meet your requirement of where to stay in London. 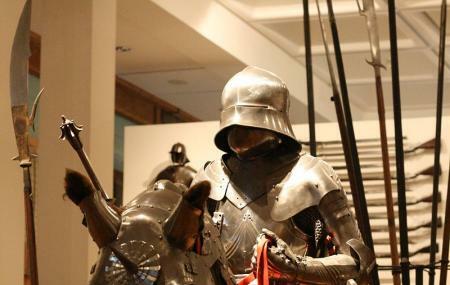 If you want to add the visit to Royal Armouries: White Tower in your trip, you can choose from the variety of London vacation packages that can be designed to suit your preferences. These packages also cover your major concern of how to reach London. Definitely one of the more interesting places to visit in the Tower. It's a climb to the top but there is so much armor on display its worth it. Was recommend by a Yeoman. Oh my god ! So much to see !! Book in advance to get in fast and enjoy. You also have one of the best views of the London Bridge for the perfect picture. Join the free tour for insights ! Display of armour and weapons that have been a tourist attraction here for hundreds of years. Mostly modernised for the current exhibition. A lot of what is here is nearly 500 years old! Included in admission price. Entrance is now on the south side. North side for those with disabilities or moving dufficultues. The staff couldn't be more helpful. Just ask! The armory was fantastic! Plenty of armor and weapons displayed inside as well as knights on horseback and other interesting artifacts related to the Tower. Easily to walk through and an interesting and informative museum for all ages, would definitely recommend! One of the most decorated parts of tower of London. It is an artillery museum keeping on display old armour and weapons. What makes this place beautiful and worth your time is it's architecture. It an old old but well preserved and quaint. You would love sitting here and imagine how beautiful it would have been in its time.